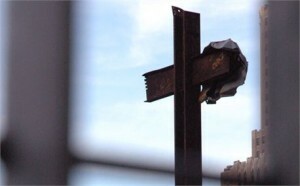 Manhattan, New York — A federal judge appointed by former president Bill Clinton has thrown out a lawsuit filed by a national atheist organization that sought to remove a steel beam cross from the 9/11 Museum in New York City because it promoted Christianity. As previously reported, the group American Atheists stated that the cross, which was found in the rubble following the 2001 attack on the World Trade Center, has caused individuals to suffer “depression, headaches, anxiety, and mental pain and anguish,” and even indigestion. It had filed suit against numerous responsible parties, including the Port Authority of New York and New Jersey, the World Trade Center Memorial Foundation and New York City Mayor Michael Bloomberg. Attorneys for the museum filed a motion to dismiss the lawsuit last August, and have been waiting on an answer from the court ever since. Area residents who supported the display stated that they were upset by the legal challenge. American Atheists says it is disappointed in the outcome. He plans on filing an appeal in the case. Museum curators state that they are elated with Batts’ ruling. “[I am thankful that the court] agrees that the display of the World Trade Center Cross is not a constitutional violation but is in fact a crucial part of the 9/11 Memorial Museum’s mission of preserving the true history of 9/11,” president Joe Daniels told reporters.